Last newsletter I forgot to introduce myself. Hello, I am the new VP Relations. I have many names. Everyone usually calls me Nadhif, but sometimes I am referred to as Rahmanta. They are my middle and first names respectively. I am the human entity behind the newsletters that you all are getting. Anyway enough about me, let’s get to the real updates. 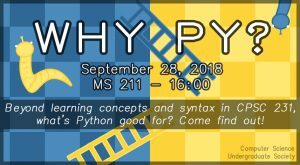 If you are interested in learning about further applications of Python, more than what was taught to you in CPSC 231, then mark that date on your calendar now! Furthermore, if you are still doing your undergraduate studies and are interesting in doing research and publishing it, then I have some good news for you! Lastly, some reminders. 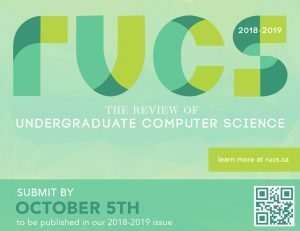 The Computer Science department is undergoing a curriculum change and they are looking for representatives to give ideas and feedback regarding the curriculum. Don’t forget to come to our Meet and Greet event this coming Friday! For more information on these two things, you can check out the previous newsletter by clicking here. Also, if you haven’t renewed your CSUS membership (or haven’t payed for it if you are a new member), then drop by our office at MS 130 and the membership fee is $5.